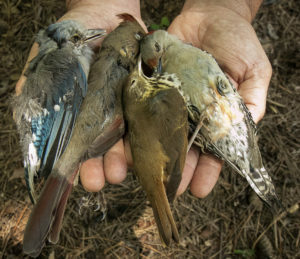 This article is based on a blog article by Kelsey Kuhnhausen of the Portland Oregon Audubon Society, and the information is based on actual data from their Wildlife Care Center. Other information is provided by the American Bird Conservancy. Over the past year, the Wildlife Care Center (WCC) in Portland, Oregon took in over 3,100 patients of 160 different species. These animals came in for many different reasons, from a young barn owl who fell into motor oil to a little brown bat stuck in a glue trap. The details of the individual stories are infinite, but sadly, the plot-lines are often the same, and the recurring theme is that interactions between wildlife and humans often results in injury for the wildlife – and it is often unintentional. Excludes intakes where injury cause was indeterminate. This year and virtually every year, the number one cause of injury in the animals received are cat attacks. These wonderful pets are also finely tuned predators, and free-roaming cats can have devastating effects on local wildlife populations. The injuries that cats inflict are often severe and even minor injuries are prone to life threatening infection. Remember that the animals that actually make it to the WCC are only a small proportion of those affected by free-roaming cats since many animals are killed outright. 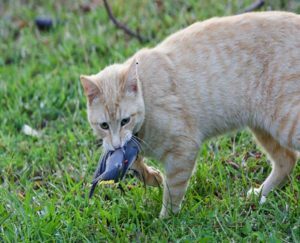 In a 2013 study titled, “The impact of free-ranging domestic cats”, the authors estimate that free-ranging domestic cats kill 1.4–3.7 billion birds and 6.9–20.7 billion mammals annually in the mainland areas of the contiguous United States. Wildlife populations face pressure from human sources, and cat predation is a significant piece of that puzzle. The Wood Thrush, Ovenbird and other near-ground nesters are of particular concern in our area. Of course, this is a humane issue for our pets as well; there are numerous dangers to unsupervised outdoor cats, often resulting in disease, injury, and a shortened lifespan. If you are looking for practical solutions to keeping your cat safe while protecting birds please check out American Bird Conservancy’s “Happy Cats, Healthy Birds” campaign website. Some options include “catios” (cat patios) and other outdoor enclosures. Although these are only two out of dozens of possible causes of injury to wild animals, together cats and window collisions make up more than 50% of the injury cases the WCC sees each year, and both are preventable! So make those windows visible, reduce light pollution around your yard and keep your cat indoors or in outdoor enclosures to keep birds safe.